Visual Lure was recently contracted to design an identity package with two new logos, one for Lutz Agency, Inc., and the other for its sister company Agri-Business Services. The Lutz Agency is a full service insurance company that focuses on protecting farmers and agricultural entities, but also provides life, health, home and auto insurance to non-ag clientele. Since most of their clients are farmers, but not all, they wanted the new logo to reflect that, but in a subtle way as not to alienate their non-ag customers. Our solution was a crest/shield (representing protection) combined with fields on green and gold representing agriculture (the gold also represents sunlight). 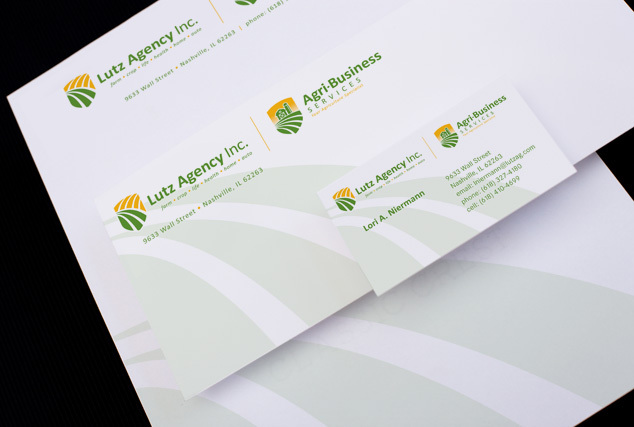 As far as the new Agri-Business Services logo, they wanted it to be different, but complement the new Lutz logo, so we used the same colors, the same typeface, the same shield shape and slightly modified the field. To finish it off, we designed a simple custom farm illustration.